Crop rotation is an important tool for our first line of defence in Western Canada. From a pathologist’s perspective, a wheat-canola-wheat-canola rotation – a single year between host crops – is not long enough to realize one of the benefits of rotation and allow decomposition of any infested crop residue. Variety resistance is also an excellent tool. When you have a variety with good levels of resistance, you really don’t need to spray a fungicide. The problem is that in your field you’re facing a range of diseases and it’s been very difficult to get varieties that have good levels of resistance to absolutely every disease issue that you might have in that field. If you have a tight rotation, your variety may not have the package of resistance that you need and, as a consequence, you will start to rely on fungicides. We like to use the disease triangle to express what a disease is all about. It’s the result of a susceptible host, a favourable environment and sufficient quantities of a virulent pathogen. The key thing to remember is that what you do in terms of crop management practices will impact the interaction of those three factors and ultimately, the risk of disease. At a trial in Melfort, Sask., three barley varieties rated susceptible (Sundre), intermediate (Chigwell) and with a good resistance package (Vivar) against net-form net blotch were sprayed with Twinline (metconazole + pyraclostrobin) fungicide at the flag-leaf stage. With no fungicide application, Sundre had just under 20 per cent leaf area diseased on the penultimate leaf, but there was very little disease on Chigwell and Vivar with or without a fungicide. With a fungicide, there was a dramatic reduction in disease with Sundre. If we look at yield, Sundre went from around 115 bushels per acre (bu/ac) without a fungicide to 145 bu/ac with the fungicide application. Chigwell had a bit of a response to fungicide application, which may be because it has an intermediate level of resistance. Vivar’s response to fungicide was basically flat. So, if you’re using a resistant variety that is giving you the protection you need, you don’t need to worry about putting on a fungicide. In terms of fungicide application timing in cereals for leaf disease, it is important to know where yield and grain fill comes from. The literature suggests the wheat ear (head) contributes about 22 per cent to yield, while the flag-leaf contributes about 40 to 45 per cent, and penultimate (leaf below the flag) contributes about 23 per cent. Those are the key plant tissues that you want to protect. In barley, the flag-leaf is less important because it tends to be quite small in some varieties. The literature for barley suggests the head contributes around 13 per cent, the flag-leaf stem 25 per cent, the flag-leaf nine per cent and the penultimate about 20 per cent. Overall, if you’re looking at a target as far as protecting the plant tissues that are key for grain filling and yield, the upper canopy tissues in those cereal crops are going to be your target. The characteristics of the pathogen can be very important when trying to improve your ability to manage plant diseases with a fungicide. A monocyclic pathogen has one cycle of spore production, host infection and disease development, so there’s a very specific target there. Fusarium head blight (FHB) is a monocyclic pathogen. Polycyclic pathogens cycle on the living crop more than once per growing season. These are diseases like stripe rust, tan spot, Septoria, net blotch and scald. This cycle may mean you can’t rely on a single application and may need several applications to get the level of control you desire, especially with highly susceptible varieties and under favourable weather conditions. Stripe rust is an example of a polycyclic pathogen. It can move from spring wheat onto winter wheat seedlings in the fall. If I were advising a producer, I would note the presence of stripe rust in the fall and then be out in the winter wheat field as soon as the crop started to re-grow in the spring to see if the stripe rust fungus had survived. 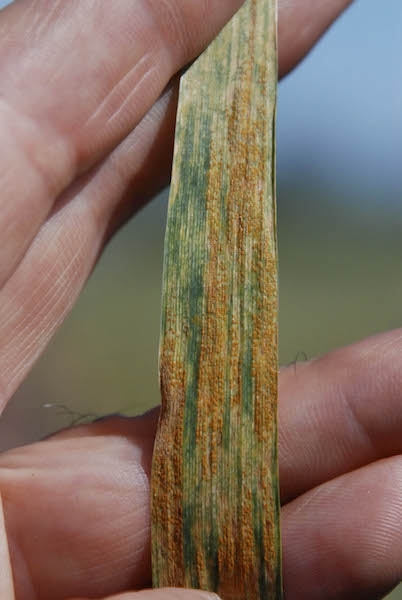 The stripe rust pathogen can rapidly cycle on the wheat crop: spores released from pustules on infected leaves are carried by the wind to healthy leaf tissue where they germinate, produce hyphae, penetrate plant tissue and within seven to 14 days, you’ll have symptoms – including pustules that produce a new crop of spores. So, every seven to 14 days, stripe rust can cycle on the crop well before head emergence. Thus, later on, on those upper-canopy leaves, you may see symptoms of stripe rust that can cause significant concern, especially if the disease becomes established in the crop before flag-leaf to head emergence. What about pathogen adaptation to the active ingredients in fungicides? Pathogens with a high risk of adapting to the active ingredients in fungicides have the following characteristics: they have mixed reproduction, so they reproduce sexually as well as asexually; and they also have an outcrossing system of reproduction where with they have male and female isolates – or mating types, – so you need a male and female for sexual reproduction to occur. Sexual reproduction where different mating types are needed has the potential to create more genetic variability in the fungal pathogen, which can then be selected for when applying a fungicide. The other important thing is high genetic and pathogenic diversity in that pathogen, which increases the risk that a pathogen will adapt. An example of a pathogen at moderate to high risk of adaptation to either plant disease resistance or fungicide active ingredients is the net blotch pathogen. In a study funded by the Western Grains Research Foundation, Alireza Akhavan, a PhD student working at the University of Alberta, found high levels of genetic/pathogenic diversity in the net blotch pathogen. It also reproduced asexually as well as sexually and with mixed mating types. Using a laboratory assay, Alireza found a few isolates that were insensitive (resistant) to Tilt (propiconazole) and, in some cases, insensitive to Headline (pyraclostrobin). Randy Kutcher at the University of Saskatchewan is also looking at the tan spot fungus and potential insensitivity in the tan spot population. Shifts in the fungicide sensitivity of cereal pathogens have been recognized in Europe for some time now and there have also been reports of changes in North America. For example, in February 2015, Chris Mundt and colleagues at Oregon State University put out a disease update notice (Oregon State University, Disease Update, February 20, 2015, Chris Mundt, Mike Flowers, Nicole Anderson and Clare Sullivan), stating that, based on surveys from 2014, there were indications some fields had Septoria resistance to strobilurin (Group 11) fungicides. They also reported resistance to triazoles (Group 3) was starting to build. Their recommendation in that part of the Pacific Northwest was to only apply a fungicide for early-season leaf disease control when stripe rust was present, because the fungicides were still effective against stripe rust. They also recommended using a succinate dehydrogenase inhibitor (SDHI) fungicide (Group 7) once per year, and for growers who did so to combine it with either a strobilurin or perhaps a triazole. Click here to see part two: managing the tools available, including fungicide application timing trials. Stripe rust is a polycyclic pathogen that can rapidly progress. Crop rotation and variety resistance are important tools for our first line of defence against disease.